While participating in the international Gothia Cup U-18 Football Tournament, Pakistani Islamabad Football Association (IFA) team has defeated their Indian counterpart. 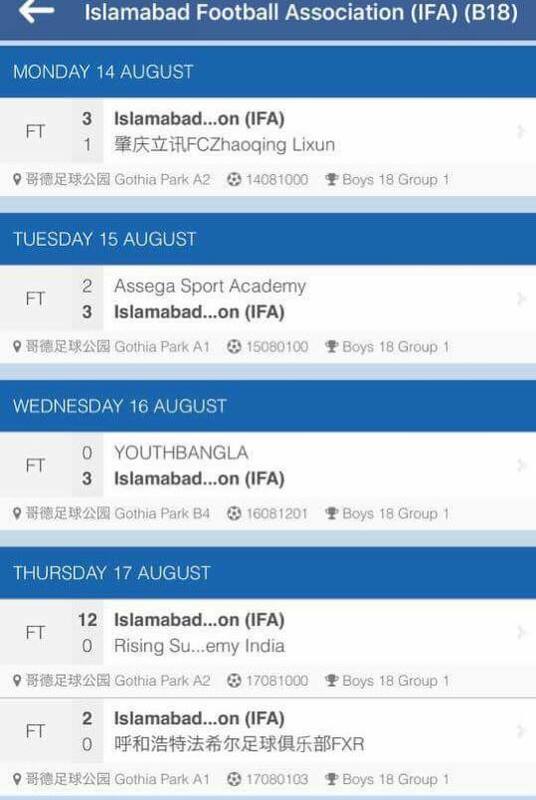 The Pakistani team faced Rising Sun Soccer Academy from India, and managed to thrash them by 12 goals without response. IFA started the game with flying colors and managed to take a 7-0 at the end of first half. Abdullah Shah, Ahtisham and Naufil Hussain — 1 goal each. General Secretary, Islamabad Football Association, Syed Sharafat Hussain Bukhari said that tournament is being played on league system. IFA was to play a total of 6 matches in its group. It has already played 4, and has won three of them.. Manager, Syed Tanveer Ahmed, Assistant Manager, Muhammad Zaman and Coach, Javed Somroo, were happy and congratulated the players. Former Secretary General, Pakistan Football Federation, Col (R) Mujahid Ullah also congratulated the players and officials over the victories. IFA will play the final with Zhaoqing Lixun FC in the final of the competition.